Celtic goalkeeper Artur Boruc handed Hibs victory over league leaders Celtic after a five-goal thriller to leave the Leith men the only side unbeaten in the SPL. Mark Wilson and Shunsuke Nakamura were ruled out for the champions after picking up injuries in their Champions League match against Shaktar Donetsk and were replaced with Jean-Joel Perrier-Doumbe and Aiden McGeady. Hibs were without the suspended Clayton Donaldson, while Filipe Morais dropped to the bench, with Steven Fletcher and Kevin McCann being granted starting berths. Manager John Collins sprung a surprise by adopting a 3-5-2 formation that had backfired on a couple of previous occasions. And goalkeeper Yves Ma-Kalambay was forced to make a couple of blocks from Scott McDonald efforts after the Australian exploited the extra space just outside the six-yard box. But Hibs stunned the visitors when Fletcher’s slightly deflected drive from 25 yards somehow managed to deceive Boruc as it squirmed over the Pole’s body and in to the net. That settled the home side, but they suffered a blow on 19 minutes when Fletcher was stretchered off following a 50-50 challenge with Stephen McManus. And the Edinburgh side were pegged back seven minutes later after a swift interchange of passes between McDonald and Jan Vennegoor of Hesselink inside the Hibs box set up McGeady to drive the ball into the net from 16 yards. Collins had seen enough and pulled off young Lewis Stevenson after 29 minutes and his replacement, Morais, made an immediate impression with some clever jinking runs from central midfield. The former St Johnstone and Millwall player was involved in Hibs’ second goal four minutes before the break. Thierry Gathuessi pounced on a poor headed clearance by Gary Caldwell to blast the ball into the far corner from 15 yards. 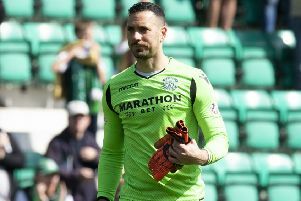 Hibs were first to threaten after the break and Caldwell cleared from in front of his own goal after Morais had beaten Boruc to a through ball and lobbed the goalkeeper from an acute angle. Mickael Antoine-Curier and substitute Shiels both fired efforts wide, but Celtic started to take control. Only two desperate late lunges from Rob Jones denied Paul Hartley and Scott Brown being put clear close to goal. And Ma-Kalambay did well to turn a powerful McGeady effort over the crossbar. But, from the resulting corner, Caldwell headed powerfully home from eight yards. Just when it looked like Celtic would save their unbeaten league record, Boruc dropped Merouane Zemmama’s drive and Shiels forced the ball home. Hibs: Ma-Kalambay, McCann, Murphy, Jones, Hogg, Gathuessi, Stevenson, Kerr, Beuzelin, Antoine-Curier, Fletcher.